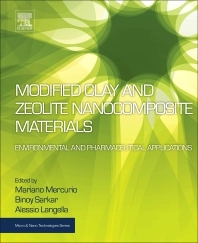 Modified Clay and Zeolite Nanocomposite Materials: Environmental and Pharmaceutical Applications retraces the most important knowledge gaps that the scientific community is facing, including a drawback of real-world applications. This valuable resource explores the novel applications of this group of nanomaterials that can be suitably surface-modified to obtain properties that can be applied in environmental and pharmaceutical fields. For example, modification with surfactants has given new motivation to the study of these materials by producing an inversion in the ion exchange behavior from cationic to anionic. This strategy has paved the way for new uses highlighted in this timely resource. Mariano Mercurio is currently an assistant professor in the Department of Sciences and Technology, at the University of Sannio, Italy. He graduated in geological sciences in 2004 from the Università degli Studi di Napoli Federico II, Italy. He received his PhD in Earth and Life Sciences from the University of Sannio in 2010. His research principally focuses on the study of georesources of the Campania Region (natural zeolites and clayey minerals) and geomaterials of archeological and historical importance utilized in the built environment. He is an active reviewer for several international scientific journals including the Journal of Food Engineering (Elsevier), Periodico di Mineralogia (Edizioni Nuova Cultural), the Journal of Hazardous Materials (Elsevier), Powder Technology (Elsevier) and Processing and Application of Ceramics (PAC) and is an active member of numerous professional and scientific associations, such as the Ordine dei geologi della regione Campania (OGC); Società Italiana di Mineralogia e Petrologia (SIMP); International Natural Zeolite Association (INZA);Società Italiana della Scienza del Suolo (SISS); .Associazione Italiana per lo Studio delle Argille (AISA) Italian Society for the Study of Clays and Gruppo nazionale informale GABeC (Georisorse, Ambiente, Beni Culturali). Binoy Sarkar is an early-career researcher based at the Future Industries Institute, University of South Australia. He received his PhD in Environmental remediation from the University of South Australia in 2011. He has over nine years’ experience in water treatment research underpinning principles of applied clay mineralogy, environmental nanotechnology, chemistry and microbiology. He is currently the technical editor for the International Journal of Agriculture, Environment and Biotechnology (New Delhi Publishers) and has been the Managing Guest Editor for two special issues in Applied Clay Science (Elsevier) on ‘Clay-based EnvRemTech and in Environmental Technology and Innovation (Elsevier) on ‘Innovation in clay and nanomaterial-based environmental remediation’. He is a reviewer for several international journals and an active member of numerous professional associations and societies including: the Clay Minerals Society of America; the Australasian Soil and Plant Analysis Council; the Australian Nanotechnology Network; and the Australian Clay Minerals Society. Alessio Langella is currently a full professor in the Department of Sciences and Technology, University of Sannio, Italy. His research interests include: Mineralogical characterization of microporous materials with specific reference to zeolitebearing tuffs (phillipsite, chabazite and clinoptilolite); Technological characterization of zeolitized materials; application of natural zeolites; Laboratory simulation of zeolitization processes; the Study of the decay processes affecting stone materials used in the historical architecture, and Archaeometric studies on potteries aimed at recognizing ancient techniques, raw material supplying areas for the production of manufacts of archeological relevance. He is a member of the Advosry Board of the Italian Journal of Geosciences and an active reviewer for most of the major international journals on Earth Sciences and Cultural Heritage.